The week just gone we spent a few days with great friends over in Sweden's capital city Stockholm, the last time I visited it was turning into deepest, darkest winter, achingly cold despite all our layers, and a time of long dark days and even darker nights. In the real North it can be a dark (literally) place at that time of year. But come summer, the Swedish embrace it as they should, just a few weeks after Midsommer - a holiday second only to Christmas, Stockholm was buzzing, very warm indeed and short shorts, bronzed blondes seemed the order of the day. And, that was just us! Joking aside the sights were as healthy as you could imagine, it was a case of sunglasses on and watching the world go by. We spent time under the hospitality of our Our Culture brothers, taking in many of the delights the city has to offer, including some great pubs and bars and cool stores and a rummage through various vintage stores and markets too. Going over in summer, it was a time to explore the natural beauty, in particular a trip across the ocean and see some of the real Scandinavia we'd never normally get to experience. The Baltic sea takes in the archipelago, an array of islands ranging in size, formed by a post-glacial rebound, this sees an array of rocky islands poking from the ocean, from the tiny groups of rocks to ones big enough to live on exclusively . It wasn't until the Viking Age that the archipelago began to assume its present-day contours. In 1719 the archipelago had an estimated population of 2,900, consisting mostly of local Fishermen. 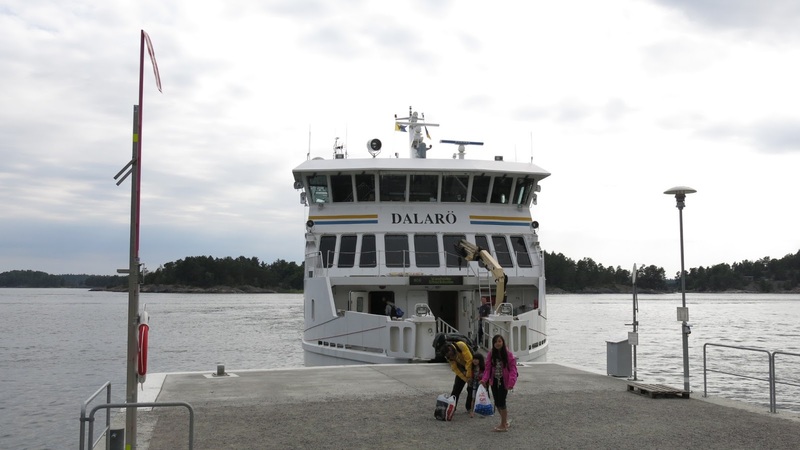 Today the archipelago is a popular holiday destination with some 50,000 holiday cottages and private housing. Whilst we in the UK get imported trendy Swedish flat-pack furniture, you should see some of the real Scando architecture out there, great, glassy minimilist modern apartments perched amongst the rocks on this amazing landscape. A joy to behold. We travelled via boat which was pretty much a sea bus, stopping to drop off and pick up various folk at their respective stops. together with our local companion and great friend K, plus his beautiful bulldog Freja in tow, we made a day of it, taking in the great, fresh sea air on a scenic trip out to Grinda which took around two hours, but it was in no way gruelling. The islands were superb, it looked every bit as Scandinavian as you'd expect - but also like nowhere I've ever been, then as the rocks got bigger, the forests deeper, it put me in mind of North America, or Canada even, notably the Sopranos episode 'Home Movies', which I'm sure will make sense if you're a fan of that show, who isn't? What do you mean you've never seen it? go away quickly. I wouldn't have wanted to have been anywhere else in the world right then as it indeed whizzed by me and the cold, weak cans of lager bought onboard were supped, I have had many worst Thursday afternoons, trust me. I truly love the water, it'll take all your cares away, I don't get on it enough, I think the last time I was anywhere near the ocean, bar Genoa this spring, was a trip to Anglesey about five years ago, so I was definitely having a paddle in this one. As soon as our ship pulled in it was trainers off and toes in, the water was so clean and not even remotely cold, the sea clashed with a lovely, quiet, rural landscape with wildlife roaming in the distance, I could live here for sure.